June 2018 sees the total nonfarm payroll employment increased by 213,000 and the unemployment rate rise 4.0% from the previous 3.9%. The U.S Bureau of Labor Statistics has stated that job growth mostly occurred in the professional and business services, manufacturing and healthcare industries while retail trade industries faltered and lost jobs. June saw the total unemployment rate rise by 0.2 percent to make the rate 4.0% overall. The number of unemployed persons also increased by 499,000 to 6.6 million overall. Looking back at the previous year, the unemployment rate was at 4.3% and the number of unemployed personnel was 7.0 million. In the major worker groups, the unemployment rates among adult men were 3.7% and adult women standing at 3.7%. These two working groups and the Asian worker groups at 3.2% had an increase in the month of June. The unemployment rate for teenagers was at 12.6%, Whites at 3.5%, Blacks at 6.5% and Hispanics at 4.6% showing no change over the month. When it comes to the unemployed, the number of job losses and people with temporary jobs increased by 211,000 in June resulting in an overall 3.1 million. The total number of re-entrants into the labor force rose by 204,000 leading to a total of 2.1 million. Re-entrants are those people who previously had worked but weren’t a part of the labor force prior to when they began their job search. In terms of the number of long-term unemployed persons (people who have been unemployed for 27 weeks or more) increased by 289,000 in June, totaling 1.5 million unemployed. These long-term unemployed people accounted for 23% of the total unemployed. June saw the civilian labor force grow by 601,000. The labor force participation rate increased by 0.2% over the month to 62.9% overall but hasn’t depicted a clear trend so far this year. The employment-population ratio, however, has been unchanged at 60.4% in June and has been essentially flat since February of 2018. The total nonfarm payroll employment for the month of June increased by 213,000 and has risen by 2.4 million over the past year. In June, job gains occurred in professional and business service industries, manufacturing industries and the healthcare industries. 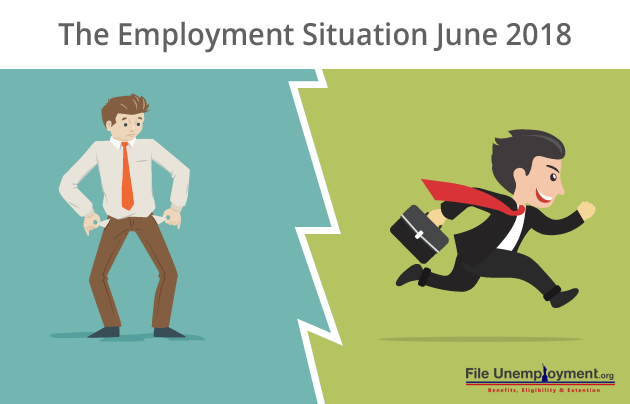 However, the month of June saw a decline in employment in the retail trade industry. The professional and business services industries increased jobs by 50,000 in the month of June, all of which has contributed to the 521,000 jobs created in the past 12 months. The manufacturing industries added in 36,000 jobs in the month of June. The durable goods manufacturing industry accounted for nearly all the increase in employment, with the inclusion of job gains in fabricated metal products (+ 7,000). Computer and electronic products had an increase in 5000 jobs, primary metals with 3000 jobs and motor vehicles and parts with 12000 jobs. The increase in jobs for the motor vehicles and parts industries comes after a large decrease of 8000 jobs in May 2018. Over the past 12 months, the manufacturing industry overall added 285,000 jobs. The Healthcare industry in the United States increased its employment by 25,000 in the month of June. Over the year, the healthcare industry has added 309,000 jobs in the United States. In the healthcare industry, hospitals added in 11,000 jobs and employment in ambulatory health care services added in 14,000 jobs. Employment in the construction industry has a constant uptick in employment with 13,000 jobs in the month of June. Over the year, the construction industry has garnered 282,000 jobs. Employment in the mining industry continued in an upward trend with 5000 jobs added. The industry suffered a low point in October 2016 and since then added 95,000 jobs. The addition of jobs was mostly in support activities for mining. The month of June saw the retail trade industry lose 22,000 jobs. The decline of jobs will majorly impact the gain of 25,000 jobs that were made in May 2018. In terms of major industries, there was little or no change in the month of June. The industries that saw minimal change in employment are the wholesale trade, transportation and warehousing, information industries, financial activities, leisure and hospitality industries and government-run industries.